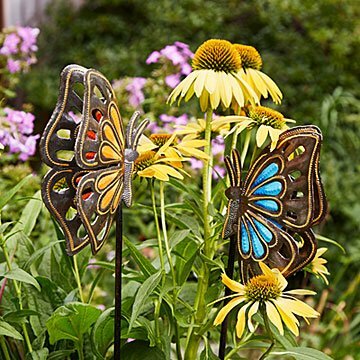 Haitian metal artist Louis Juste Omiscar transforms used oil drums into beautiful butterfly garden stakes. These colorful and super-strong butterflies migrated all the way from Haiti to flutter over your garden. Beginning life as 55-gallon steel drums full of oil, they are cleansed with fire and flattened by Haitian apprentice metal workers. Now the metal's ready for master artist Louis Juste Omiscar. He cuts, pounds, and decorates the metal in a unique style he has developed over the years. After painting, a long-lasting, weatherproof finish is applied. And now a winged Haitian beauty is ready for its new home among your flowers and greenery. Sales of Louis-Juste's beautiful metal art have enabled him to send his two children to school. He says that when he makes garden stakes, "It let me smile." Only at UncommonGoods. Handmade in Haiti. If using this stake in an outdoor setting, please use a gloss spray varnish to keep it protected. Untreated, your piece may begin to rust.